KNAC.COM - Reviews - MAYHEM,INQUISITION,BLACK ANVIL In Washington, D.C.
MAYHEM, INQUISITION, BLACK ANVIL In Washington, D.C. The lone regret of my real-job trip to Kodiak, Alaska, last May was having to miss the American debut of MAYHEM’s homage to its legendary/infamous 1994 debut De Mysteriis Dom Sathanas at the Maryland Deathfest. 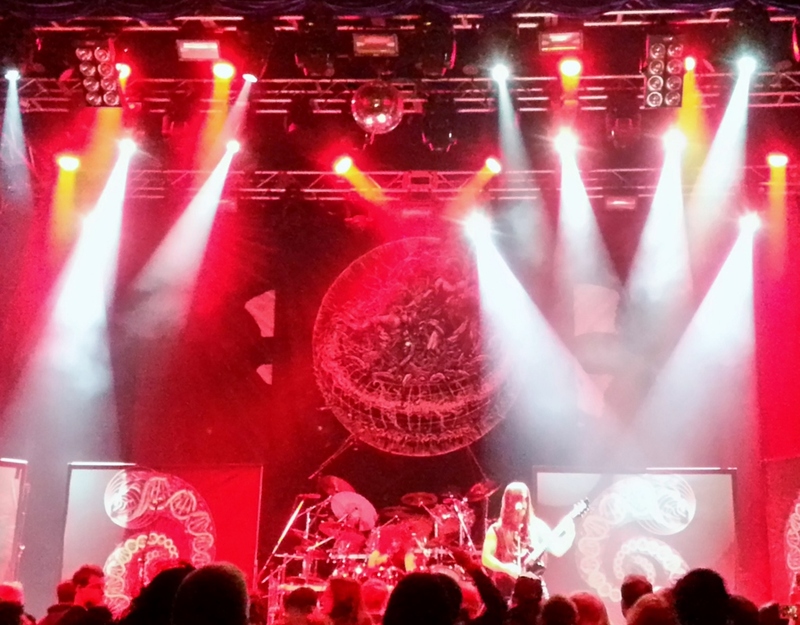 But now that the band has undertaken a full-blown U.S. tour of De Mysteriis shows - to again perform the album in its entirety - and I was afforded a second chance to see it much closer to home in D.C., I’m actually glad I had to wait. The album is a genuine benchmark for “true Norwegian black metal.” Given its fraught history that included the suicide of original singer Dead and the murder of guitarist Euronymous by guest bassist Varg Vikernes, among other traumas, during its seven-year gestation, dark ritualism and atmosphere are key to its groundbreaking sound and mysterious aura. And no offense to the Deathfest, but a show staged in a downtown parking lot below a freeway overpass on a muggy Memorial Day weekend is not exactly the kind of setting the stark, tumultuous De Mysteriis deserves. Washington's grand, century-old Howard Theater – which is noted more for jazz, blues and soul events – was a surprisingly fitting venue with its regal architecture, apse-like stage area and elaborate lighting, even if the crowd of 300-400 was perhaps 10 percent the size of the Deathfest audience. The intimacy accentuated the atmosphere, lending an element of ceremony to the proceedings and transcending the notion of mere “metal show.” Indeed, this was a genuine performance, a spectacle, a mix of musicality and theatricality that made De Mysteriis truly come alive. It was as spellbinding and majestic as it was visceral and intense. On one of the final dates of the month-long "Purgatorium Americæ Septentrionalis MMXVII" tour, MAYHEM showed no signs of road-weariness. If anything, the band seemed to be riding a full head of steam into D.C.
Draped in hooded robes, shrouded by dry ice smoke and bathed mostly in ominous purple and blue lights, guitarists Teloch and Ghul, founding bassist Necrobutcher and long-time drummer/human tornado Hellhammer tore through the hour-long set – which included eerie taped interludes between each of the album's eight songs to stretch out its 45-minute run time – with determined vigor. Like true “Lords Of Chaos”, the seasoned lineup also brought a new depth and sophistication to the raw, unorthodox brutality of the source material. That unorthodoxy, however, was personified by frontman Attila Csihar, one of metal's most magnetic, enigmatic figures. Here, he assumed a role that seemed equal parts shaman/high priest and living corpse with his hood partly masking his flaky, ashen face makeup that recalled the walking dead from Lucio Fulci’s splatter classic Zombie. When Csihar wasn’t delivering his haunting, horrific growl/gurgle/chant/scream vocals, he was gesturing and contorting wildly to the music or conducting ceremonial rites over a candle-laden altar set up before Hellhammer’s expansive drumkit. 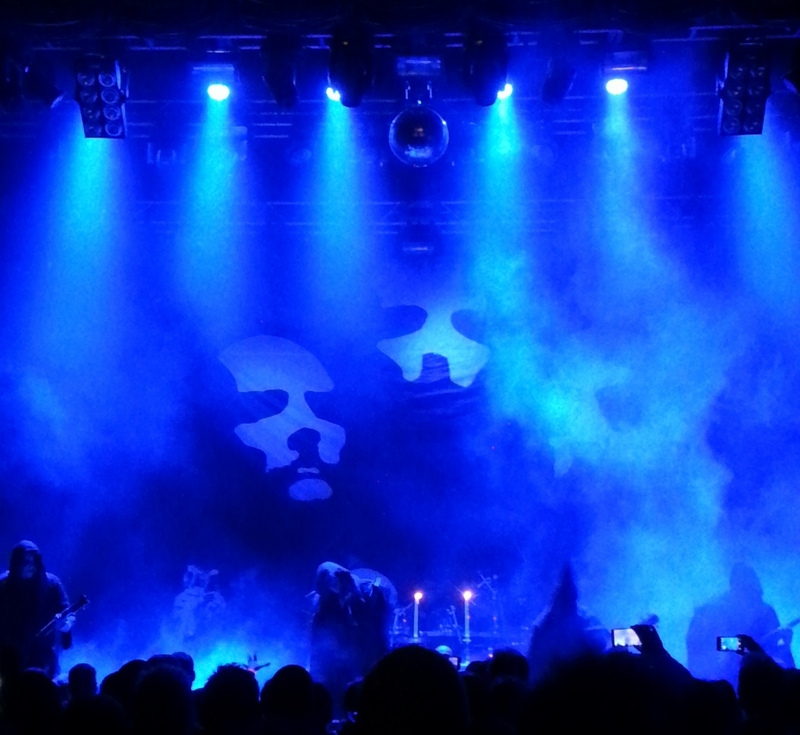 Add the banner of Nidaros Cathedral from De Mysteriis’ cover art behind it all, and it truly felt like black mass in the church of the damned. It was a genuine experience – and it was awesome. New York’s BLACK ANVIL and the Seattle-by-way-of-Colombia duo INQUISITION got things started with riveting sets of their own. 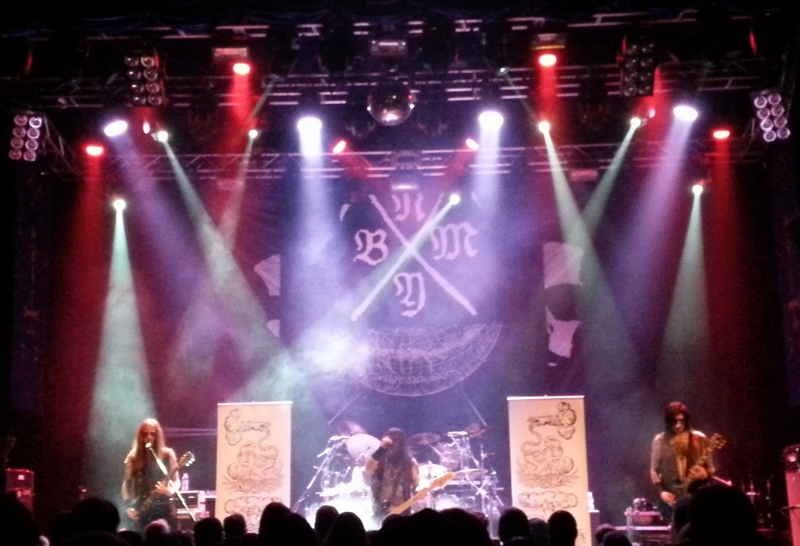 BLACK ANVIL’s epic black metal is redolent with clean vocals, two- and three-part harmonies and crunching hooks, making from some of the most complex, yet catchy and graceful music of its ilk. But long songs and a half-hour set time meant that as the band was just getting going, it was time to pack up. INQUISITION, on the other hand, was the definition of economy. Just a guitarist/vocalist, Dagon, and drummer, Incubus, the duo whipped through nine songs in 40 minutes and still had time for sound-effect heavy segues betwixt and between. With mics positioned on both sides of the stage, Dagon was able to croak out his oddly froggy vocals to the entire room while blazing away on his guitar. And between his grinding/buzzing riffs, and Incubus’ flailing battery, the band made more than enough racket to make up for not having a bassist.